Read more about the 20mph in Haringey consultation, and have your say via the Haringey Council website here. We feel that there a number of roads which are currently intended to be exempt, and will remain at 30mph. Here’s our letter to Haringey’s Cabinet Member for the Environment, Cllr Stuart McNamara. 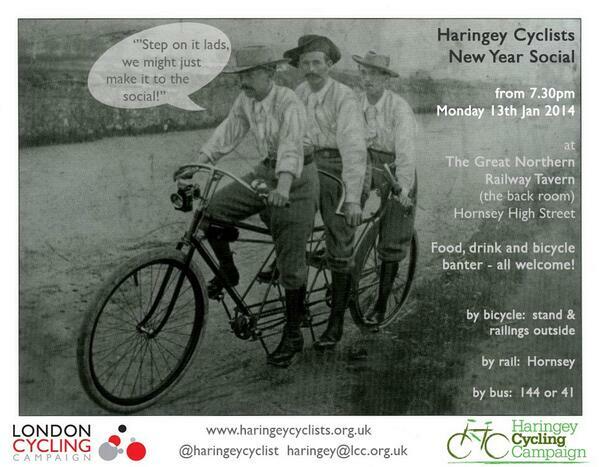 Image thanks to Bounds Green Residents Association. Fortis Green Rd, which has a number of shops and restaurants and also a very narrow section, where a 20mph limit will greatly improve road safety. Hornsey High Street, where there are many shops and restaurants and at least 3 schools in the vicinity. West Green Road, where there are many schools, shops and restaurants and where heavy traffic congestion during the day means that the average traffic speed must be already below 20mph. An official 20mph limit will smooth the traffic flow and improve safety. 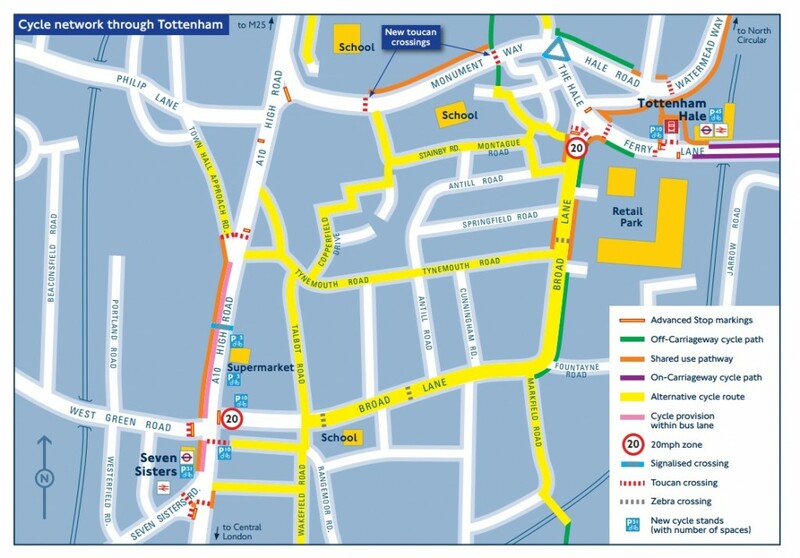 The whole of the Tottenham Lane/ Church Lane one way system, which is next to a school in one direction and leads up to shops in the other and where speeding traffic can be very intimidating in a mainly residential area. 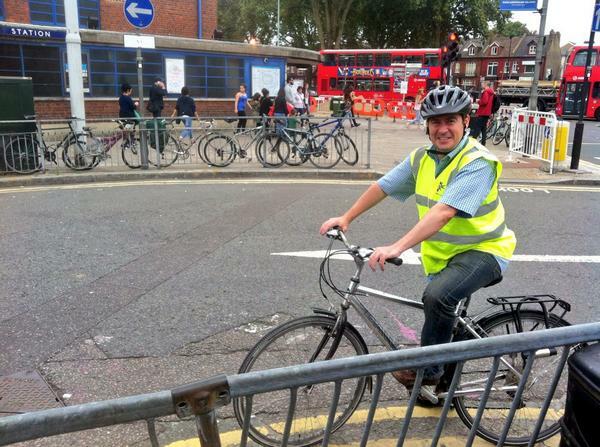 Cycling Champion Cllr Toni Mallett has said she considers Hornsey High Street and West Green Rd should in particular be made 20mph and I hope all the roads above can be looked at again, in consultation with local councillors. 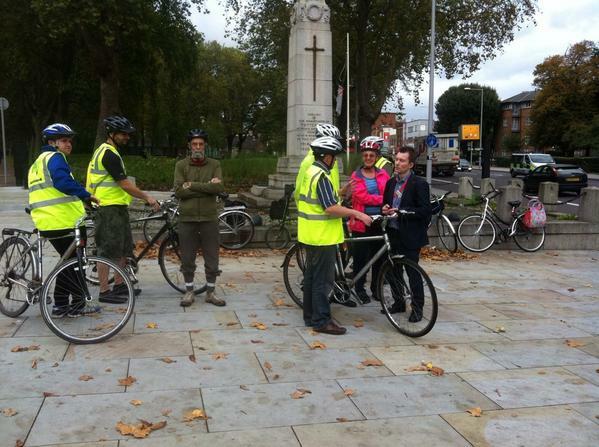 Following our successful September ride around the central third of the borough (well, Wood Green, Turnpike Lane, Harringay) with Cllr Toni Mallet (the borough cycling champion) and Cllr Stuart Macnamara (our Cabinet Member for the Environment) we held our second ride, heading east on 17th October. We were joined by 2 Project Engineers who work in the Sustainable Transport team at Haringey Council – the engineers and Cllr Macnamara borrowing council pool bikes – although Stuart has now officially sign up to keep his pool bike long term! Chestnuts Park, North Grove, Roslyn Road, Town Hall Approach, Broad Lane, Ashley Road, Park View Road barriers, Watermead Way, Northumberland park, Park Lane, Bruce Castle Park, Risley Avenue. 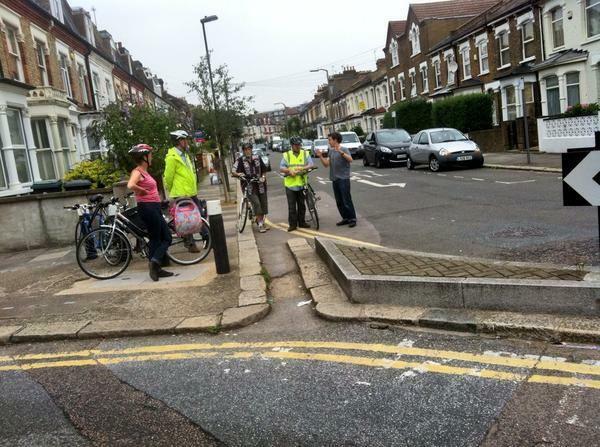 We visited a number of sites we identified as Haringey Space for Cycling ward asks – including the infamous Park View Road barrier. Here’s the notes from the ride, which we’ve presented to all present for reference. We’ve heard from a lot of people via Twitter, Facebook, email and face to face who have complaints about the new layout, often that it is ‘worse than before’ or ‘more difficult to get north to south’. We agree, but we need your comments to present during this meeting. This is our one chance to feedback to TfL. Every comment counts because ‘every journey matters’ ! Content: A brief description of your problem, followed by location if specific. We’ll collate all comments in to one document, which we’ll present at the meeting on 4th November. We’ll make the list of all comments public on our website too. *although Thames Water are still due to dig up some sections which is why there are still temporary crossings on Ferry Lane. 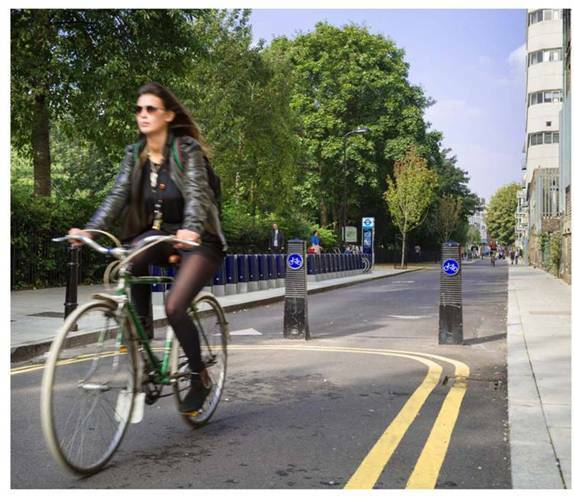 ‘Last published in 2005, the revised London Cycling Design Standards (LCDS) is a technical document that should inform design options and promote an integrated and ambitious approach to delivering high quality infrastructure for cycling in all parts of London. LCDS must be mandatory for ALL NEW WORK. Perhaps this is not the intention, but there must be NO AMBIGUITY on this. 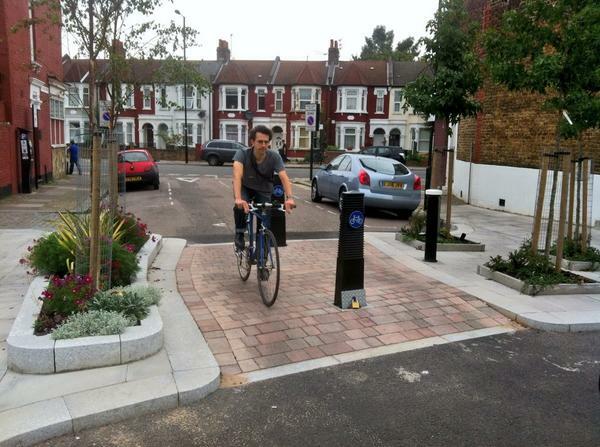 It should be made clear stakeholders need to be consulted on detailed design, including carriageway widths. On major schemes, consultation should be required at both concept and detail design stages. At all new road layouts, lead-in lanes to ASL’s should be mandatory, or the nearside traffic lane should be at least 4.5m, to allow cycle access. 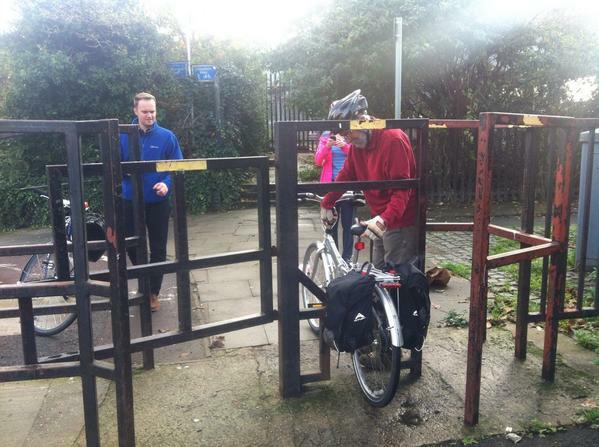 An ASL that cannot be accessed is either pointless or can encourage dangerous squeezing through narrow gaps. Sinusoidal ramps are mentioned here and in Chapter 4, however no section drawing is given. The drawings included in the 2005 LCDS are very helpful for stakeholders, to understand the concept and to allow discussion with engineers who do not always know how to get them right. Drawings for this and other construction details should be added, also perhaps a mention of the use of profile boards, which are a help for quality control. Excellent to see “Cyclists Dismount” signs are not to be used, though possibly there should be a qualification to allow them when a cycle route approaches steps. Granite setts- Use should always be avoided where straight (as opposed to staggered) jointing and/or degradation from traffic can result in a wheel trap for narrow tyres. We look forward to seeing the LCDS advice being put in to place in Haringey, and will endeavour to put pressure on Haringey Council to do so. 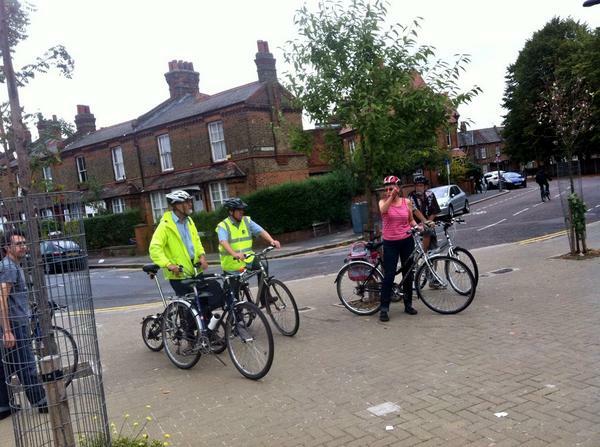 Take action now to call for safe Space for Cycling from your Haringey election candidates. In November 2013, London Cycling Campaign members and supporters completed a survey stating what changes they would like to see in their area. 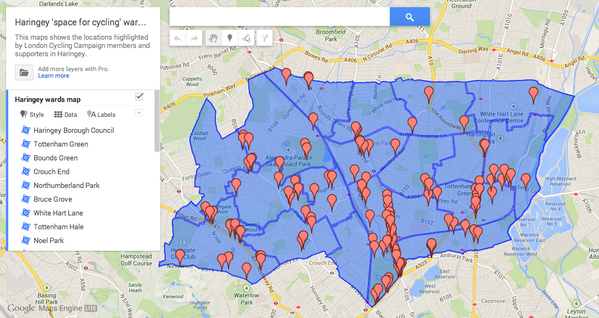 This data was the basis of the ward ‘asks’ we have created for each ward in the borough. In November, London Cycling Campaign set up a survey and asked for feedback on barriers to cycling in London, and in your own borough. 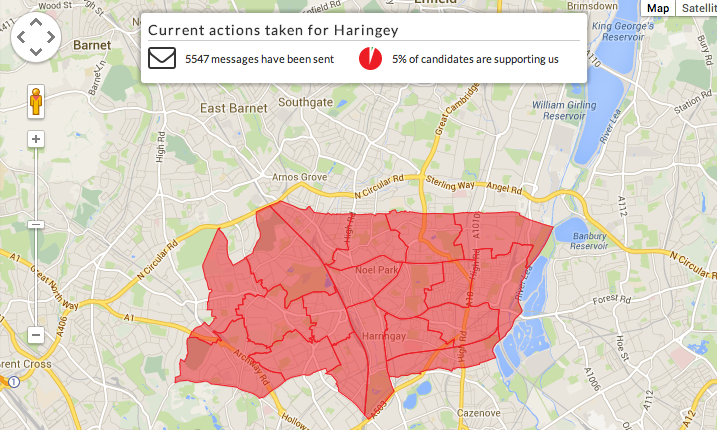 There were 144 responses in Haringey, which has given us plenty of data to look at before we decide the asks for each ward on Monday 10th February. Even at a glance, it is clear where there are clusters of ‘hot spots’. 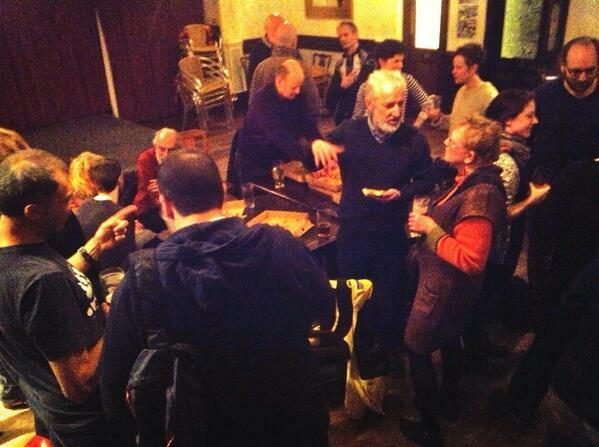 It was great to meet so many new (and some more familiar) faces at our New Year Social last Monday. We think it’s fair to say a great time was had by all. Big thanks to The Great Northern Railway Tavern for being a wonderful venue, Tomo for the delicious pizza, and Albert the pub husky (wolf) for looking like a massive teddy bear by the fire.